A nice and simple post from me Today. I just wanted to rave a little bit about two products that I have been using religiously for the last few months. Collection 2000 or Collection as they seem to go by these days is fab for quick fixes and budget buys, but if I’m perfectly honest I’ve not really tried that many of their products. I attended a local Blogger event back in April and these two gems were included in the goody bag that we all received. I am so glad that they were as I would never have got to try them otherwise. So these two products are Collection 2000 Primed & Ready and Fix Me Up – the perfect duo to help you achieve long lasting and flawless looking makeup. PRIMED & READY is face primer that you use before you apply your foundation. I love this because it feels so silky soft on the skin. It goes on clear and and dries matte, which is fantastic on the oilier parts of the face, i.e nose and forehead. Collection 2000 says that this is great for minimising pores, smoothing the skin and hiding blemishes. I can’t say I’ve noticed it hiding blemishes as it’s a translucent product but it does do a fab job at smoothing the skin and my makeup looks so much more even with this on underneath. FIX ME UP is a spray that you use after you’ve applied your make up. It’s meant to set your make up and lock it in place so that your hard work doesn’t get undone throughout the day! Fab right? I’ve been using this like a ritual ever since my first spritz, not only does it give longer lasting make up but I just love how it makes my makeup look fresh and glowy. It’s also great for refreshing your make up throughout the day if you need a little pick me up! I wont say that your makeup will look exactly the same in the evening as when you applied it in the morning, but it does help to make it last longer. I find that I’m touching up my make up a lot less and also since I have dry skin, this has also helped to stop my make up from flaking off (Gross, I know – I’m so sorry for painting that picture for you). I’ve gone through the first lot I got from the goodie bag and am now on my second set. They are relatively small items at 18 mls and for £5.99 each. I’d say each tube would last you a month if you use it everyday like me. Anyhow I just thought I’d share with you because I really think I’ve found my makeup bag must have for Autumn/Winter. My skin is the driest at this point in the year and I believe this set will be a life saver! 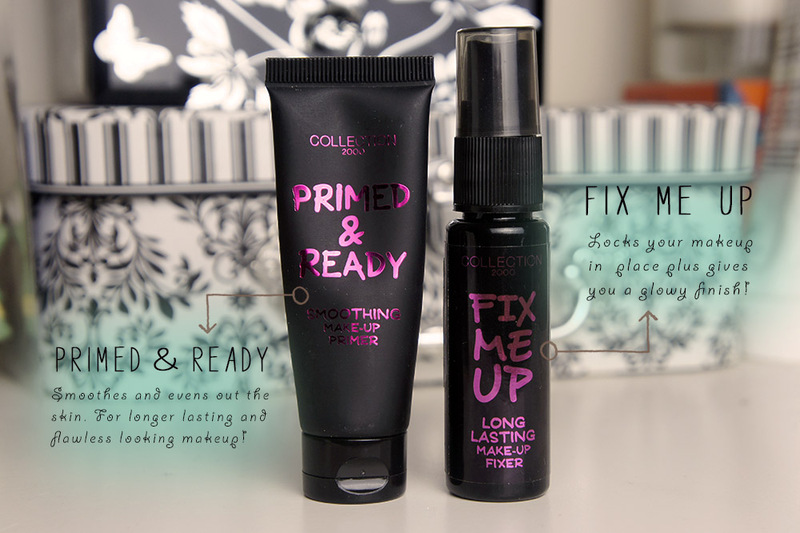 Have you used this Makeup Primer and Fix set before? What are your thoughts? Tags: Collection, collection 2000, Face Primer, Fix me up, Primed and ready, review. Bookmark the permalink. Previous post ← How to fake Healthy looking hair: For Dry, damaged hair. That makeup setting spray looks like it would be such a great product. I’m already obsessed with my Urban Decay setting sprays. I am so glad I discovered it, my routine seems incomplete without it now lol! Would you like to follow each other via bloglovin, twitter, instagram and gfc? If so just let me know and I’ll follow you right back!